In Irish mythological cycles, Brighid (or Brighit), whose name is derived from the Celtic brig or "exalted one", is the daughter of the Dagda, and therefore one of the Tuatha de Dannan. Her two sisters were also called Brighid, and were associated with healing and crafts. The three Brighids were typically treated as three aspects of a single deity, making her a classic Celtic triple goddess. Brighid was the patron of poets and bards, as well as healers and magicians. She was especially honored when it came to matters of prophecy and divination. She was honored with a sacred flame maintained by a group of priestesses, and her sanctuary at Kildare, Ireland, later became the home of the Christian variant of Brighid, St. Brigid of Kildare. Kildare is also the location of one of several sacred wells in the Celtic regions, many of which are connected to Brighid. Even today, it's not uncommon to see ribbons and other offerings tied to trees near a well as a petition to this healing goddess. "When two religious systems interact, a shared symbol can provide a bridge from one religious idea to another. During a period of conversion, an archetypical symbol such as fire may acquire a new referent, while not being entirely emptied of a previous one. For example, the fire that clearly signifies the presence of the Holy Spirit in Saint Brigit may continue to signify pagan conceptions of religious power." There are a variety of ways to celebrate the many aspects of Brighid at Imbolc. If you're part of a group practice or a coven, why not try honoring her with a group ceremoy? You can also incorporate prayers to Brighid into your rites and rituals for the season. Having trouble figuring out what direction you're headed? Ask Brighid for assistance and guidance with a crossroads-themed divination rite. In northern Britain, Brighid's counterpart was Brigantia, a warlike figure of the Brigantes tribe near Yorkshire, England. She is similar to the Greek goddess Athena and the Roman Minerva. Later, as Christianity moved into the Celtic lands, St. Brigid was the daughter of a Pictish slave who was baptized by St. Patrick, and founded a community of nuns at Kildare. "She possesses an unusual status as a Sun Goddess Who hangs Her Cloak upon the rays of the Sun and whose dwelling-place radiates light as if on fire. Brigid took over the Cult of the Ewes formerly held by the Goddess Lassar, who also is a Sun Goddess and who made the transition, in the Isles, from Goddess to saint. In this way Brigid's connection to Imbolc is completed, as the worship of Lassar diminished, only to be revived later in Christian sainthood." One commonly found symbol of Brighid is her green mantle, or cloak. In Gaelic, the mantle is known as the brat Bhride. 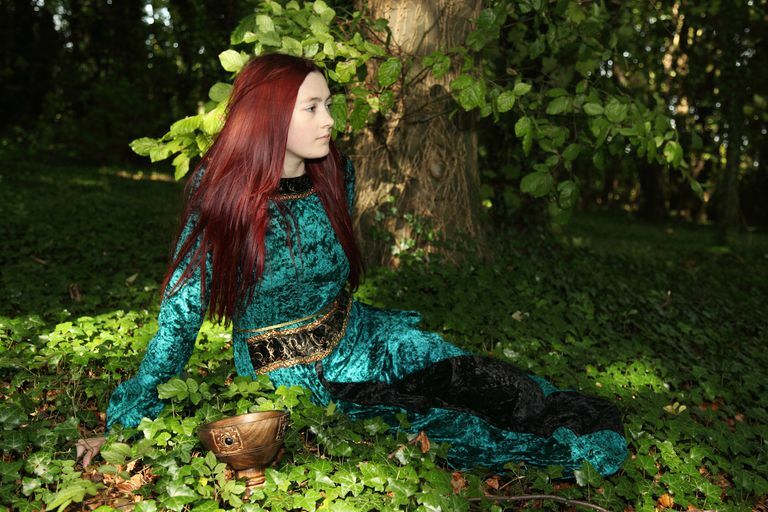 The legend has it that Brighid was the daughter of a Pictish chieftain who went to Ireland to learn from St. Patrick. In one story, the girl who later became St. Brighid went to the King of Leinster, and petitioned him for land so she could build an abbey. The King, who still held to the old Pagan practices of Ireland, told her he'd be happy to give her as much land as she could cover with her cloak. Naturally, her cloak grew and grew until it covered as much property as Brighid needed, and she got her abbey. Thanks to her roles as both a Pagan goddess and a Christian saint, Brighid is often seen as being of both worlds; a bridge between the old ways and the new. In Celtic Pagan stories, Brighid's mantle carries with it blessings and powers of healing. Many people believe that if you place a piece of cloth out upon your hearth at Imbolc, Brighid will bless it in the night. Use the same cloth as your mantle each year, and it will gain strength and power each time Brighid passes by. The mantle can be used to comfort and heal a sick person, and to provide protection for women in labor. A newborn baby can be wrapped in the mantle to help them sleep through the night without fussing. To make a Brighid's mantle of your own, find a piece of green cloth long enough to comfortably wrap around your shoulders. Leave it on your doorstep on the night of Imbolc, and Brighid will bless it for you. In the morning, wrap yourself in her healing energy. You can also make a Brighid's cross or a Bride's Bed to celebrate her this time of year.